​Kelly Van Dyke was born and raised in Los Angeles, California ​with seven brothers and sisters in a very loud Irish family. She grew up around dirt bikes always taking trips to the desert with the boys. Although she never had a bike of her own, once she was tall enough to hop on the little dirt bikes, her and her sisters finally got the chance to feel the wind while adventuring on two wheels. It has always been a desire of hers to get her M1 Endorsement and become a regular on a motorcycle. After obtaining a double major in English Literature and English Education from California State University Long Beach, she spent several years teaching and being part of the administrative team in a private school in Orange County. 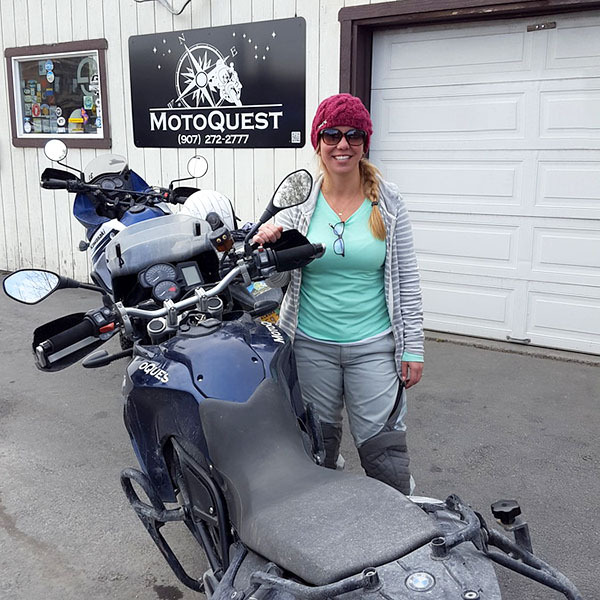 An opportunity presented itself not once but twice with MotoQuest and by the second time, she couldn't resist the taste of the adventure that being a part of MotoQuest had to offer. While being a small part of the MotoQuest team, in the large motorcycle industry, it simply was no fun letting all her male counterparts head out of the shop on bikes so she finally was able to get the M1 endorsement she always wanted. The furthest ride she's done after learning some bike street smarts from the boys, has been to Kernville and back. With the support and back up from the crew here at MotoQuest, she too is becoming a polished rider in hopes to continue enjoying all the fun on two wheels! Quote: This too shall pass. Favorite Motorcycle Experience: Dirt bike riding with my dad and siblings. Worst Motorcycle Experience: Haven't had one yet!